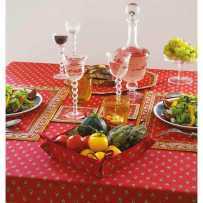 With its cheerful colors and its vitamin motif, this item is designed to be a picnic tablecloth. 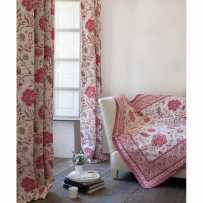 It is made with great care by a three generations textile house in the region. 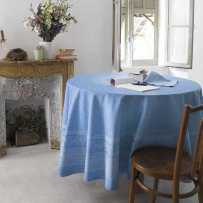 You may want coated cotton tablecloths, more waterproof to protect from stains. 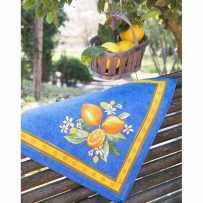 The Citron pattern evokes the Cote d'Azur and especially the splendid city of Menton, capital of the lemon festival. On a plain but textured background, a circle formed by a set of whole and cut lemons with leaves and flowers is placed in the center. The drawing is very realistic and plays on the shadows to give the third dimension to the still life. A very broad band of the drop is decorated with the same infinitely repeated pattern and thus forms the outer border. 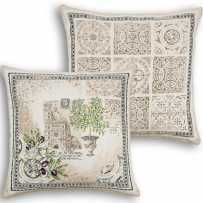 It is surrounded by friezes with Provencal motifs in bright yellow. A tone on tone strip finishes the fabric. 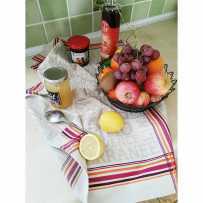 The three colors are complementary colors to the lemons yellow. 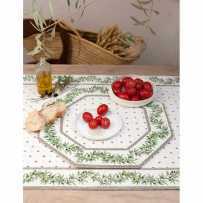 This is a table item really suitable for a lunch in the shade of a vine or as picnic tablecloth. The sun will come to highlight these appetizing lemons that one would think ready to be pressed. 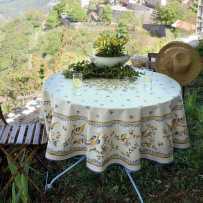 If you want to maximize perfectionism, you will use this table cover while serving an orangeade to your guests, during a hot summer afternoon. 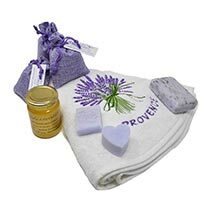 They are available from this page: napkins and bread basket to match your beautiful Provencal round tablecloth. 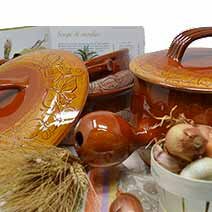 In kitchen accessories, the Citron motif is no exception either. 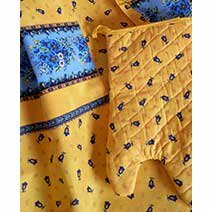 The quilted hand protectors (gloves and potholders) of the same collection are available in our catalog.